I had my first holiday to alykanas in 2002 and have ventured between both which resort do you prefer and why? Then it seemed Alykes had more happening now it's the other way around. My first holiday was the litsa with no pool back then. Loved the grapevines too. What memories do you have? 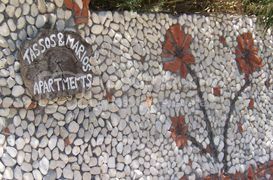 So many memories Mari...we have stayed at Maria's studios in Alykes, great place but a fair walk to the beach especially when it's hot.Have also stayed at Koukounaria. We tend to choose Alykanas, then walk between resorts of an evening. We have stayed at Plessas Palace ( Why palace? ) a few times, Letsos Hotel Alykanas Beach more than a few times, Danny's a few times, then found White House to our liking, just great for us fills all the boxes. Alykes .... 1st found Alykes and the Nikos in 2007 and have been going back every year since. Back out in July and as always I will be at the Nikos. We first went in 2004 and stayed in Grapevines, then the same again in 2005 & 2007. Then once easyJet started operating we ditched the packages and have been staying in Xechoriati booking direct ever since; much as we enjoyed our times at Grapevines (and a sneaky week at Zante Garden one year) I don't think we'd ever go back to it. Completely different vibe in the old village which we love, but can still easily get to the A's for a meal or a lemonade or two . Can't wait for our hols this September in White house studios. Have queried on here and also on Trip Advisor re new studios being built there but no response so far.